Now that I, Dakota, am done throwing my jolly ball around, I am ready to tell you a story. I am not sure if you are aware of this or not (you should actually), but Serena made a Chichi® sculpture in a wheelchair to raise awareness for accessibility for people with a disability. 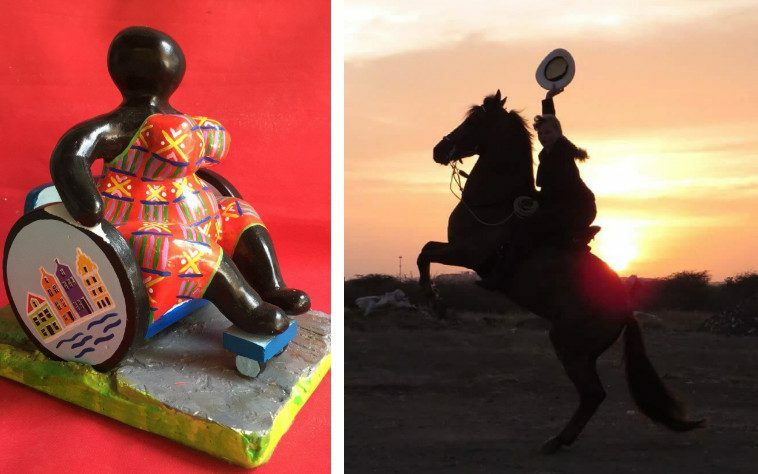 These sculptures have been in production since this summer of 2018. Just when I was thinking about this brilliant project, I found myself to be a part of it! Now, Chayen makes me the therapy horse sometimes. I once heard her say something about how riding horses like me is a calming experience for people with a disability. I’m a pretty calm and an easy going horse, so of course they chose me to be the therapy horse instead of Cappoccina de la Reina, my sassy sibling. Please, do not tell her I said that! I am an intelligent horse! I identify individuals around me, and I alter my behavior towards them. So, when I know it’s Chayen, I will go absolutely crazy and try to kick her off my back. I mean, she had me ever since I was a foal, so I get to mess around with her and have some fun. On the other hand, I sense when I have to be calmer, like when there’s someone with a disability riding me. When someone is different, I will be different too. You can compare me to magic, as you can clearly see the difference in the energy of someone with a disability from when they first arrive at Serena’s Art Factory and how their experience with me completely calms them. People even fall asleep, that is how relaxed they get. Do you know what relaxes me? Bananas, that’s right. Currently, I am mad about bananas, but Chayen knows that my cravings change like crazy! Hey, I have an Idea: let’s find Chayen’s slippers, so I can chew on them… Shh!